WRX STi Spec C "Tommi Mäkinen"
The WRX STi Prodrive Style was available in many Conutries. In Germany, it was blue coloured, elsewhere it was also black and silver. 1000 cars were built worldwide. The "PD" has a big rear wing, other side skirts, fog light covers, a Prodrive-grille, front bumpers and a blue speedometer with red hands. In some markets it also had a roof-mounted vent. 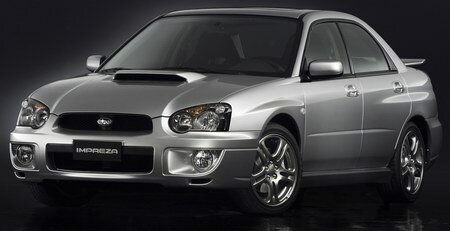 The STi of model year 2007 is now available as a "Limited" in Switzerland, Germany and the USA. Most important characteristics are the tail spoiler lip and the black brake calipers. In Japan, there was the A-Line with the same features. At the end of 2017 the european importers presented the end of the fast turbo models in Europe because of the strict emission regulations. In Germany, there are 150 cars announced for summer 2018. In Scandinavia there are the Final Edition cars almost at the end of 2017. Only in Great Britain there are additional stickers announced. 1998 Subaru Germany brought the special model Classic to the market. This five-door in black mica was sold with wood and leather interior trim. 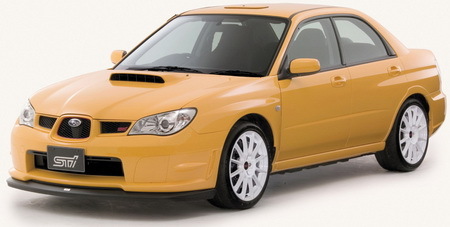 In addition to the "WRX STi Prodrive Style", Subaru Deutschland sold a few cars of the stock-WRX with parts from Prodrive and called it "WRX Prodrive". 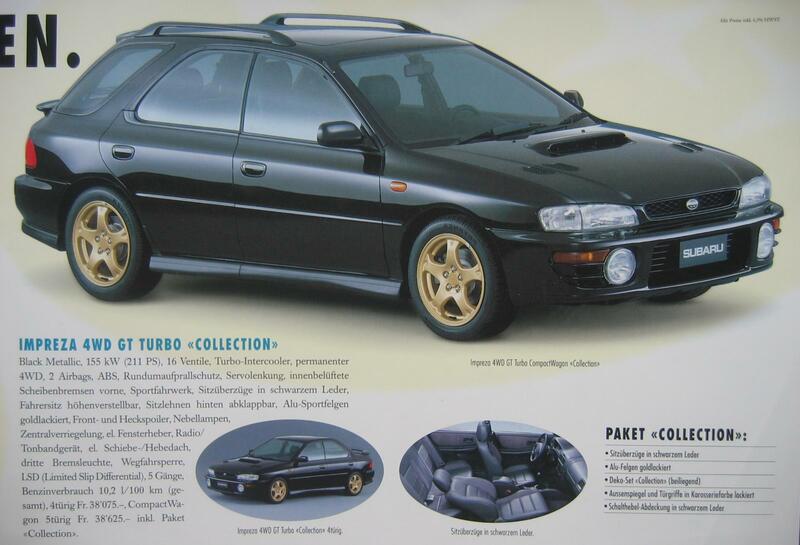 For there was no DCCD available for the STi in Germany, Subaru Deutschland made a small special edition of 15 cars with this option and additionaly the "Blackline"-interior with a black center console and black seats. The 2007 Limited edition got the smaller rear wing and the MY07 back lights. The other accessories were the same as in the year before. 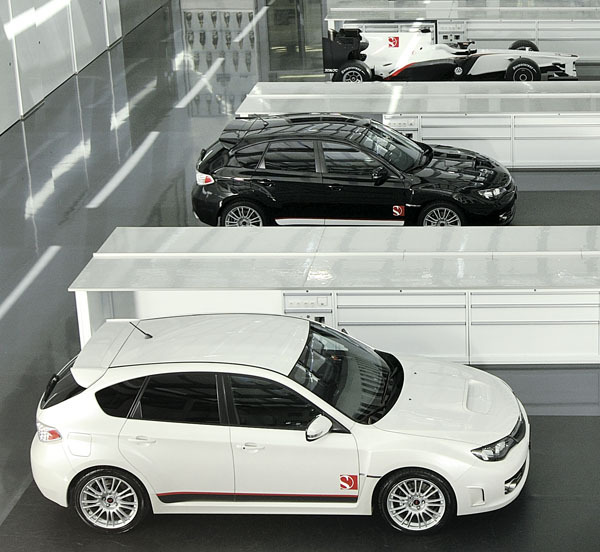 To celebrate the WRC-Victory this 4 and 5 door special edition was offered in white, grey mica, green, red and black. The "555" came contemporary to the "Collection". The "Collection" came contemporary to the "555". 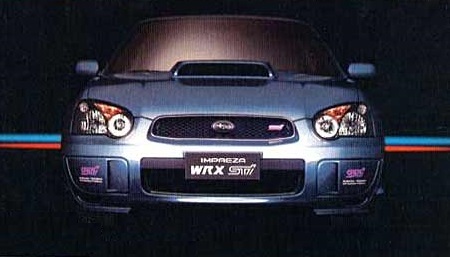 A special edition of 80 cars called "WRX" was selled in 1999. It had blue/black seats and door trim with alcantara. The back seats were not foldable, the sideskirts, door handles and rear mirrors were colour-coded. The price was 38,925 CHF. 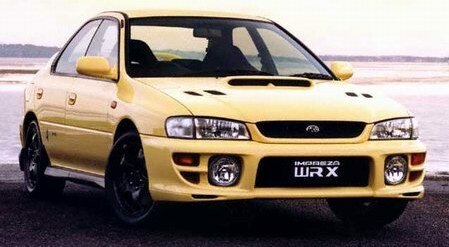 As the WRX, the SuperRacing was sold to celebrate the 20th anniversary of the swiss importeur. 150 cars with a price of 41,850 CHF were built (both 4 and 5 door) in black mica (47A) only. 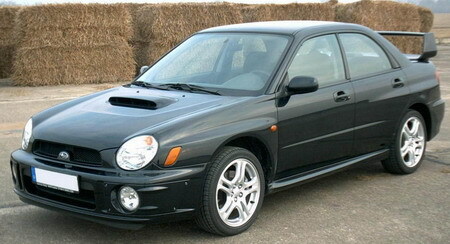 The Blackstar GT was sold in 2000 to increase the sells of the old GT before the new WRX will arrive. 100 exemplars were built and cost 44,550 CHF. 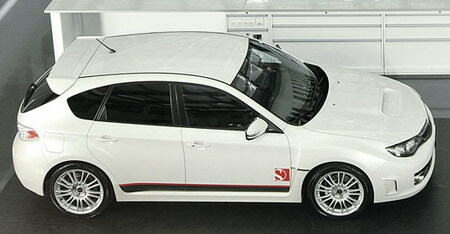 For the fans of the Swiss motorsport company "Sauber" there were made 50 Imprezas of this Edition. Number 1 and 2 had gone to the Formula 1 drivers Nick Heidfeld and Felipe Massa. 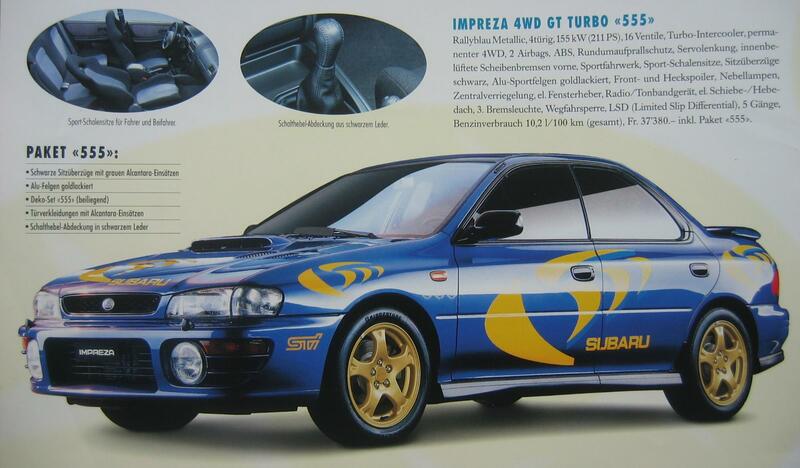 There was also a Sauber Edition of the face lifted Impreza 2003. Again 50 units were built and sold for 56,980 CHF. Contemporary to the Sauber Edition, there was the "STi R" distributed by Emil Frey. 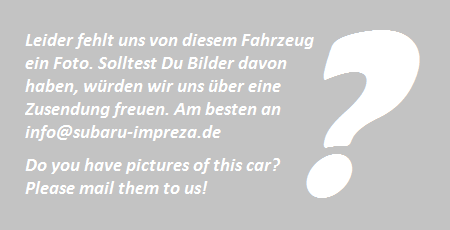 This car had only optical tuning and costs 53,790 CHF. The German Special Edition with DCCD has also been sold in Switzerland. 30 cars have been produced and had the "Blackline"-interior. 25 years of SUBARU in Switzerland were celebrated with the Anniversary Edition of the 125-PS-Impreza and the 225-PS-Version shown below. For only 1,000 CHF more you got extras worth 3,500 CHF. To celebrate the victory at the Swiss Rally Championship, Emil Frey made these versions of the WRX and the WRX STi. 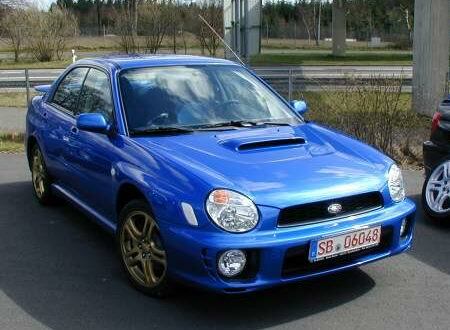 Additionally to the "Swiss Rally Champion" there was the special edition "Compact Sports" amongst others as WRX. Its supplementary equipment was worth 4,300 CHF. The surcharge for the 5 door was 800 CHF. To celebrate the limited 30th anniversary of Subaru Switzerland the WRX Celebration was sold with a few STI parts at the price of 35,900 CHF. 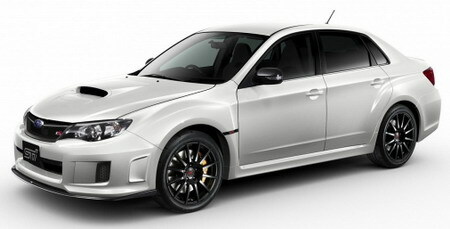 The 54,000 CHF STI special edition was sold to celebrate the 20th birthday of Subaru Tecnica International. The WRX Swiss S closes the gap between the 230 hp WRX and the 300 hp STI. Due to a redefined CPU the car reaches a power of 265 hp and 343 Nm at 4,000 rpm. It needs only 5.5 s for the 0-100 kph sprint. The special edition costs 42,300 CHF. As an official partner of the swiss Formula One Team, Emil Frey (Subaru CH) presented the limited special edition Subaru Impreza WRX STI "SAUBER Motorsport". The 25 cars were available in silver, anthracite, black, white and blue. Thanks to a number plate every car was unique. The special equipment includes the SAUBER Motorsport exteriour design, numbered SAUBER Motorsport plaque at the dashboard, a voucher for a safety training at the french Anneau du Rhin, aluminium picture frame with a photo of the SAUBER F1 race car with an original autograph of Peter Sauber, two SAUBER Team Caps and a Subaru LED pocket lamp. The car was available at a price of CHF 57,900. As the year before, Emil Frey again created 25 cars of the special edition Subaru WRX STI "Sauber F1 Team" in white colour. It had a numbered badge and a set of winter tyres. The price was 48,800 CHF. The car costs 43,900 CHF in the color Pure Red, all other colors cost extra. This Special Edition had gold alloy rims and an aluminium hood. This first austrian special edition had many parts of the italian tuner "Orciari". It costs 38.380 € and was available in premiumsilber and blue mica. After the Austrian Rally Championship in 2006 ended for the Subaru drivers Achim Mörtl with an overall victory in the Group N, Subaru Austria launched a limited edition of 50 pieces of the Subaru Impreza pro:sports:line with the title 'Champion'. The Subaru Impreza pro:sports:line Champion includes aluminum pedals, aluminum shift knob, xenon headlights, 17-inch alloy wheels, sports exhaust, climate control, radio with CD player additionally a rear spoiler, a rally sticker set in anthracite at the side and rear as well as a voucher for motor sports training with the "Champion" Achim Mörtl himself. The special model is available in white and black metallic at the list price of 26 490,- EUR. In the year 2002 Emil Frey presented the Concept Car "Type 270", but it did not reach the exhaust emission standard and so it never saw the roads of Hungary. The price shoul be 11 mio Forint. 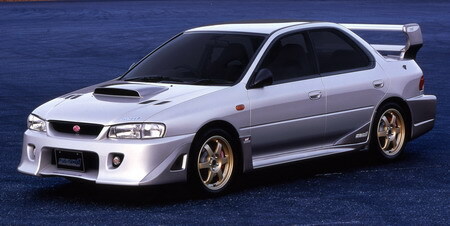 Next to the "Type 270" there was the 320 HP version of the WRX STi. The engine was leant from a rallye team and was given back after three days. That is the reason why this version never got on the road, too. 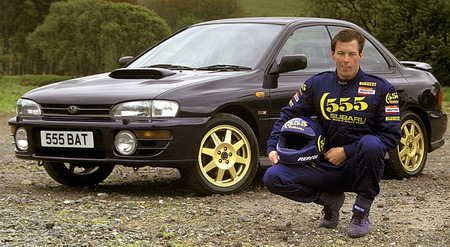 In the year 1993, six Impreza WRX RS were brought to Great Britain as vehicles for testing. They were registered as 1.8 GL models. Three of them went to Prodrive, the others were sold as used cars. 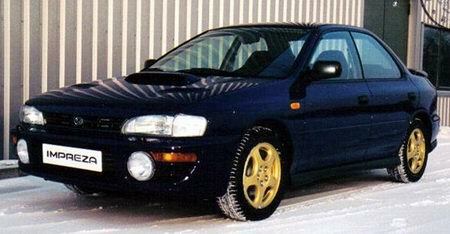 The Rallye team Prodrive improved 25 Turbo-Imprezas briefly after their introduction in England. The engine remained untouched in the first years, but there were a new and deeper suspension, other rims as well as Recaro seats inside and a carbon gear knob. In addition the customers could decide for a sport steering wheel, if they did without the Airbag. In 1996 there was also a Performance Package with a new rear silencer, RamAir filter element, enhanced engine management (240 bhp) and an uprated Mintex disc brake pad set. In June 1995, Prodrive produced 200 of this special edition to celebrate the victory of Colin McRae in the WRC. The cars were numbered from 1 to 201, no 13 has not been built. The price was 23.000£. The win of the constructors title in 1996 was celebrated with this 200 cars special edition (again without the number 13). The Rally of Catalunya was the one where Subaru got the last points for the WRC-victory. The first Cats were registered in march 1997 and the price was 21,610£. Many of them were ordered with extras like sunroof or leather seats. The third constructors championship title in a row was celebrated with the Terzo (italian for "third"). One of the 333 cars costs 22,995 £, numbered from 1 to 334, without the 13 again. 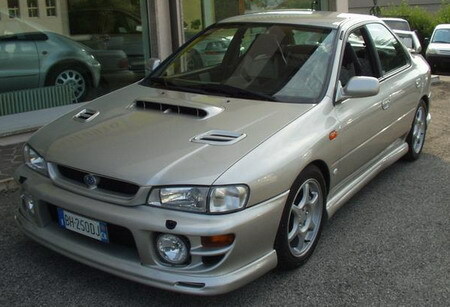 The 22B was a special edition produced by Subaru Tecnica International (STi). 16 of the 424 cars were brought to England and were rebadged as 22B Type UK. 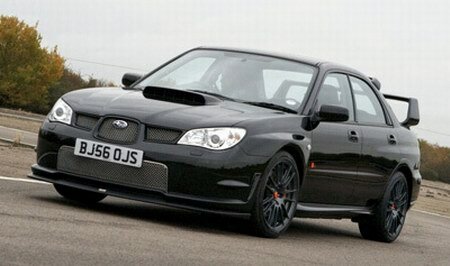 The return of Richard Burns to the Subaru World Rally Team (SWRT) brought this Special Edition to the Subaru fans. RB5 stands for his initials and his starting number. 444 cars were sold at the price of 24.995£. The version with the "WR Sport Performance Package" cost 27.500£. 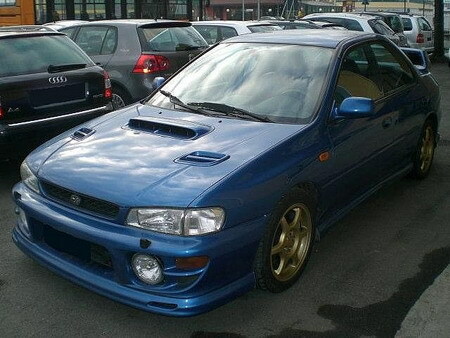 This Impreza was sold for 30.000£. The P1 (Prodrive One) has been built 1000 times for the english market only. It was available from march 2000 at a price of 31500 £. 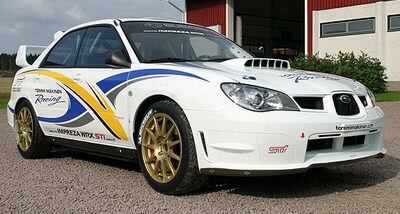 To celebrate Petter Solberg's victory in the WRC 2003, Prodrive produced one of the strongest Imprezas ever. Only 500 of the WR1 were built with a 320-PS-Engine and a torque of 420 Nm that reached 250 kph (155 mph). It could do the 0-100 kph-sprint in only 4.3 seconds. The wheel choise were 18-inch seven-spoke alloys that brought the car 25 mm closer to the road than the stock-STi. Also the interieur got a new trim. There were dark shaded seats and another gear knob, new floor carpets and plaque with the number of the car. The price for the WR1 was 30,000 £ and it was available in UK. The tuners of Litchfield Imports took the japanease Spec C to modify it into the Type 25. It has 360 PS (@ 6900 rpm) and needs 4.1 sec for the sprint 0-100 kph. It costs 59.000 € and runs 270 kph fast. - "RAC TRACKSTAR" with a one year "FREE SUBSCRIPTION"
- available in "WR blue mica"
The Type UK is the same as the european STi's except of the right hand steering. Similarly as the Swiss "type G" the spec.D (for Discreet) aims at the customer that would like to enjoy the first-class handling characteristics of the STi paired with a discreet optics. Thus the 300 grey-metallic cars are equipped with a small tail wing and placed on silver instead of golden wheels. As is the case for the "type G" it has better noise insulation. Inside fine leather equipment provides a better ambience. The spec.D costs £28.495. Also the new Impreza got tuned by Litchfield. This time it has even 415 bhp and 570 Nm. It does the 0-60 in 3.7 sec and costs £39,995. - SmartNav satellite navigation system and touch screen with 1 year's free membership and 3 months' subscription to Safespeed. Subaru has announced a new special edition Impreza WRX STI in memory of rally hero Richard Burns who died in November last year of cancer. Called the RB320, the new car features around £6,000 worth of extra equipment including the 320 PS Prodrive Performance Pack, yet costs £29,995 on-the-road – an increase of only £3,500. Available only in Obsidian Black, the RB320 features bespoke 18 ins alloy wheels and specially developed Prodrive suspension comprising Bilstein dampers, a sports spring kit with revised rear anti-roll bar and a ride height lowered by 30 mm at the front and 10 mm at the rear. Also standard on the RB320 are a chrome mesh front grille, front lip spoiler, quickshift gearchange, side sill plates and RB320-branded gear knob, carpet mats and exclusive exterior badging. Each owner will also receive an individually numbered black alloy tax disc holder. The PPP boosts power to 320 PS at 6,000 rpm with torque leaping to 332 lb ft at 3,700 rpm. This reduces the 0-60 mph time to 4.8 seconds with a 0-100 mph time of 12.2 seconds. And as a further incentive, those customers placing early orders with deposits will be offered a limited number of places at a special RB320 launch event next March at Prodrive’s test track in Warwickshire. Not only will RB320 fans take delivery of their cars at the circuit but will be able to drive demonstration STIs around the track and meet rally celebrities. In addition, customers will also be able to register on-line and reserve the limited-edition number of their choice via a special sub-section of Subaru’s website. Finally, the first car is to be given away in a special raffle organised by Autosport magazine, donated by Subaru (UK) Limited. The proceeds will go to the Richard Burns Foundation which helps those suffering from serious injury and illness. - Only 400 cars available - 300 4dr and 100 5dr. Each one numbered. 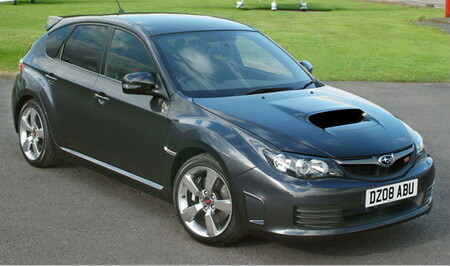 A modified ECU gives this WRX a maximum power output of 255 PS with a torque of 390 Nm. 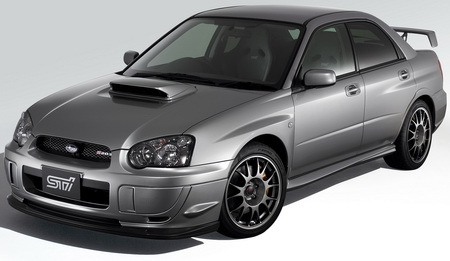 It has an STi front grille, front and rear spoiler as well as 18 inch alloy wheels. The Prodrive engineers gave this STi a new ECU programming which results in a maximum output of 330 PS. The exhaust system with a 90 mm muffler makes the car sound more sporty. 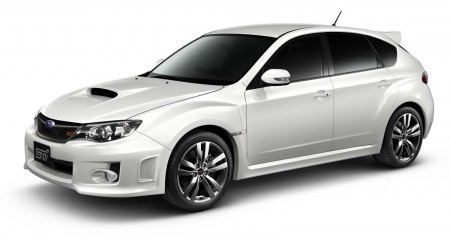 The STI 330S has a max torque of 470 Nm, Recaro sport seats and a navigation system. There is not much information about this concept car. Prodrive fits a new chassis and an aerodynamic package. A re-programmed ECU gives the car 380 PS. In the Type-20, Subaru’s 2.0-litre turbocharged engine is enhanced to produce 400PS and 508Nm (375lbft) of torque with peak torque available from 3,400rpm and maximum power coming at a heady 7,500rpm. These headline numbers however don’t do the power delivery justice with 414Nm (300lbft) available at 3,000 rpm and 345bhp at 5,400rpm that give the Type-20 a broad window of useable power. In cooperation with Cosworth, Subaru UK presented the CS400 with an output of 395 bhp. Only 75 cars were produced in red, silver and dark grey finish. Unlike most performance cars, the new special edition WRX STI 320R has an 20PS more power than a standard WRX STI and also comes with sat nav as standard. 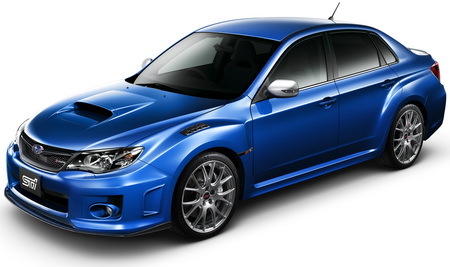 And, unlike other special editions, there's no extra cost compared with a standard WRX STI. There's even the option of a practical performance 5-door hatchback as well as a 4-door saloon. 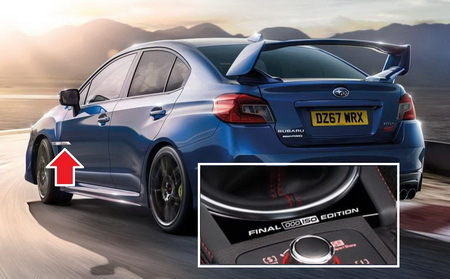 Subaru UK launched the WRX STI Final Edition, strictly limited to 150 models to say farewell to this brand icon and mark the end of the Impreza era of Subaru’s heritage in the UK. A Final Edition badge is positioned on the door and the centre console. The Edition was available to order from 1st November 2017, priced at £33,995 on the road. The 1997 555 had now black WRX seats with red ornaments and cost 166,500 francs. The special "WRX" had the same applications as the 555, but additionally WRX stickers and numbers inside and outside. The '97 model was painted in metallic blue, the '98s was black. In 1999, there was a model that should remind us of the rally successes. "WRC 99" stand together with the vehicle number on the stickers which are placed either on the trunk or on the side markers. 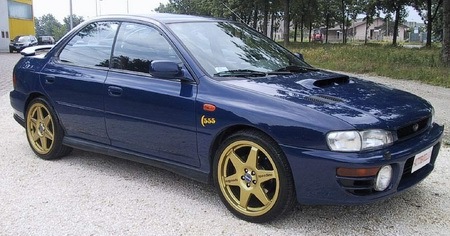 The black Imprezas were equipped with gold wheels and had blue Alcantara interior. 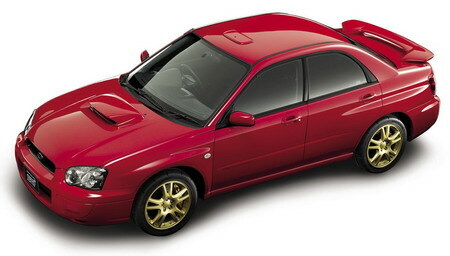 This limited edition model of the WRX continues the tradition of rally models. Again, gold rims were fitted and the serial number were added under the side markers. Subaru in France also sold a Petter Solberg Edition with DCCD. As in France, there was a 555-series in the Netherlands in the model years 1996 to 1998. These were externally mainly evident in the contrasting black sidebars. The special edition CB1 had 17" alloy wheels, colour coded sideskirts, a small rear wing and Morette headlights. Inside there was a carbon interior and alloy pedals. It costs 24,291.- €. 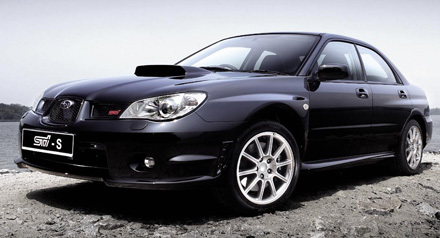 In November 2005 Subaru brought the old WRX as a 265-hp version on the market. The model was offered in a limited edition for a lower price than the STIs. 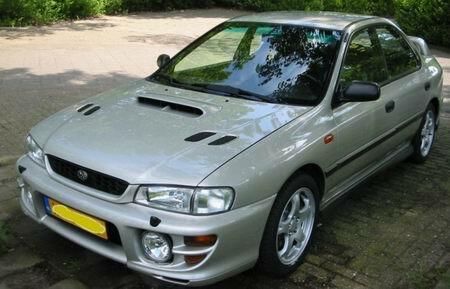 Analogous to the Swiss "type G" and the British "Spec D" the Dutch brought a more civil version of the WRX STi on the market. 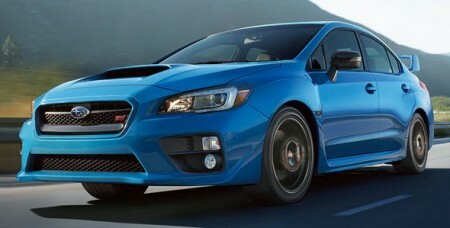 In Belgium, the Netherlands and Luxemburg, Subaru offers the WRX Edition with Prodrive grille, carpets and gear knob. This Special Edition was limited to 150 cars. It had red highlights in the seats and a number plate. In Italy for a while a 5-door station wagon was available with red ornate black seats that otherwise resembled the English "Catalunya". WWW stands for "World Wide Winner." The special edition was limited to 200 pieces. 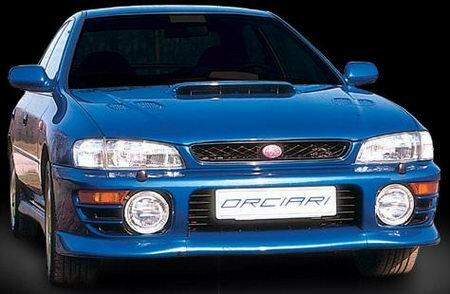 They had Nardi leather seats embossed with a laurel wreath, an Orciari front spoiler, a pink Subaru logo, gold rims and the STi Version IV rear spoiler, which was only a year later as standard on the Impreza in Europe. Moreover, the rear-view mirror was colour-coded and in the rear window was a sticker with the 3 world titles attached. The WRX Plus had blue alcantara seats. The steering wheel, hand break stick and gear knob were covered in leather trim. 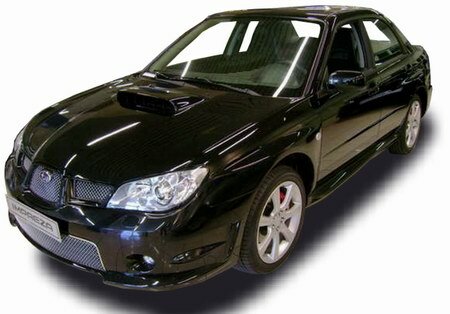 The Impreza "WRX3" was limited to 100 copies and had installed various parts of the Italian supplier "Orciari". So the larger rear wing was also installed as the front lip, Orciari grille, revised air vents in the bonnet and larger apron edges at the rear bumper. Inside, the seats covered with white embroidered nabuk and serial number are the highlights of the WRX3. Besides three extra instruments, a shift gate frame and an Orciari shift knob were mounted. Like the WRX 3, also the "Ltd." was limited to 100 copies. It had also received the Orciari trim, but instead of the leather seats alcantara seats were installed. The sporty appearance is enhanced by the blue colour. In Italy, the Solberg Edition was limited to 200 cars. It had a DCCD and the "Blackline"-interior. The most obvious characteristics of the ‘41 edition’ are the twin headlights. The car was also available in black and blue. The WRX Prodrive marks the start of a relationship with the Oxfordshire, UK-based performance gurus which will soon be extended to other products in Subaru South Africa’s range. 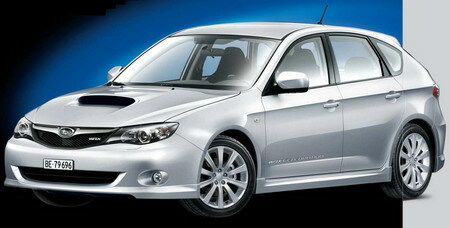 Prodrive WRX models feature a number of visual changes which provide functional as well as aesthetic benefits. Depending on where the viewer is standing, the most obvious sign that this is no ordinary WRX could be the handsome 7-spoke Prodrive wheels, or the bespoke spoiler. The latter item was developed by Prodrive and while similar to that fitted to the STI, it features additional vertical stays, engineered to aid high speed stability by increasing down force but without increasing drag. The Bridgestone Potenza tyres mounted on the eight-inch wide wheels measure 225/40/18 and along with ride height lowered by 25 mm - thanks to a Prodrive suspension package - enhance the Impreza’s level of road holding and steering response still further. Interior changes are extremely understated, and consist of a Prodrive gear knob milled from solid aluminium, and a Prodrive mat set. To celebrate the 30th anniversary the South African importer presents this special edition. It has 260 kW/354 hp and 464 Nm. After 5.03 seconds it reaches the 100 km/h marque. One of these 30 cars costs 799,000 Rand (56,730 US$) and they are available in red, dark grey, white and of course in blue. 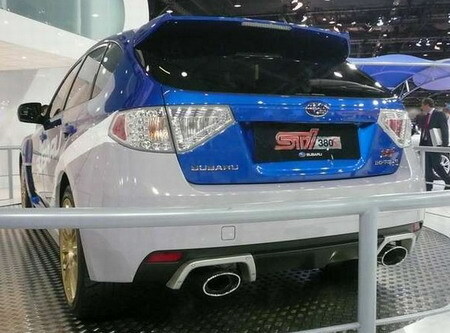 The "Limited" known around the world was named "STi-S" in Hong Kong. It had silver alloys, no rearwing and fog lights. 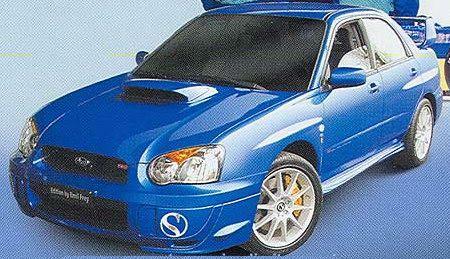 In 1995 Subaru brought this special model in an edition of 120 pieces. 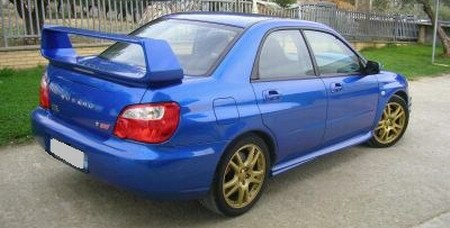 It had the stock 211 PS engine, was dark blue ("Prodrive blue") and had golden rims. The sport seats were replaced by competition seats and the interior was kept in flat black. The WRX Rallye is only available as a sedan. In 1997 some 52 were sold again. 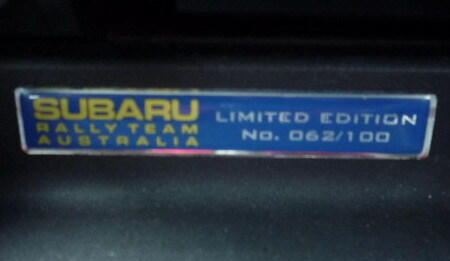 The Australian Subaru importer presented a small special series of 200 cars with the name "club Spec", which became later an annual tradition. They were available both with automatic and manual transmission, the color was 555 metallic blue. Golden rims belonged likewise to the program like red highlights in the seats. However there was not the otherwise standard Airbags in the club Spec. 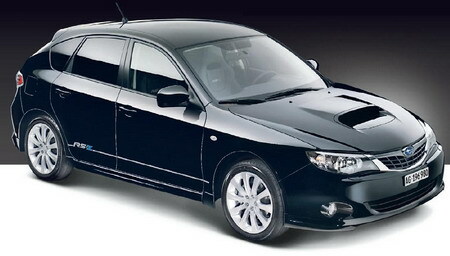 Subaru brought 220 cars of this special model in Australia to the market. It had red seats as well as stickers which marked it as special model. In addition it got golden rims and in car color painted side skirts, mirrors and door handles. 22 pieces were also sold as a 5door wagon. 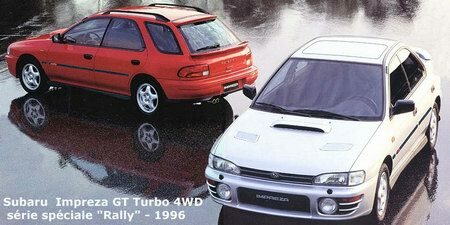 To celebrate the 25-year old existence of the Australian importer, there were two special models at the birthday, the "Silver Anniversary" Impreza WRX and the Outback GX. 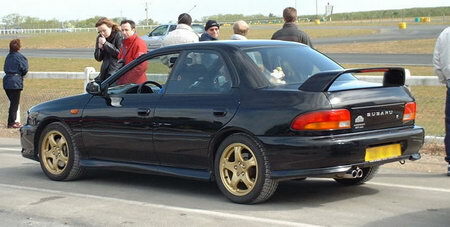 The Impreza was painted in black and got golden rims. Only a 4-gear AT could be ordered and the stock seats were replaced by leather seats. Engine-technically the stock engine with with 211 HP was used. 229 cars were built of the "Evo 2". 100 cars of the "Limited Edition" were sold in the colours WRC Blue Mica, Dark Blue Mica, Dark Green Mica and Black Mica. 150 of the club Spec Evo 3 were built. It had in car color painted side skirts, door handles and rear view mirrors and was available only in the shown "Steel Blue Mica". Furthermore it had golden rims as well as a remote control for the central locking. 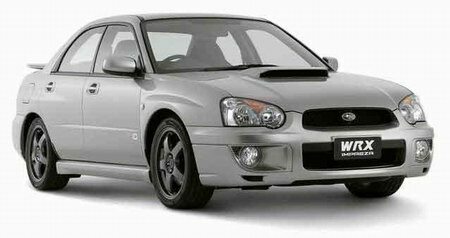 It did not have an automatic transmission and cost 1,700 AUS$ more than the standard WRX. 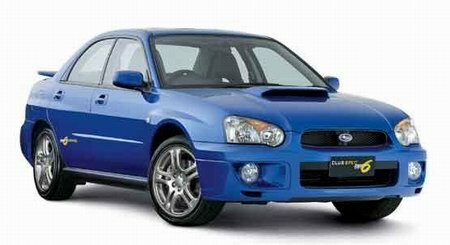 In February 1999 a new special edition of the Impreza was launched by Subaru Australia. The car costs AUS$ 42,990 with MT, AUS$ 44,990 with AT. The Classic had bright leather interior, a leather/wood steering wheel and gear knob (only MT version) and some aluminium applications. Only 150 cars were built of that special edition that was available only as sedan in black, dark blue and green mica. The door handles were colour coded. One year later, a second series apeared and was also available in dark red. Only 300 units were available of the 4th Club Spec Edition (250 sedans, 50 wagons). Every car got a numbered plaque at the center console and a yellow appearance. The standard alloy wheels were painted in black. Beyond that, the package contained a CD-Radio, STi-instruments and yellow highlights in the seats. There was only a manual transmission available. Only 100 WRX were made of this Limited Edition to celebrate the victory at the Australian Rally Championship. 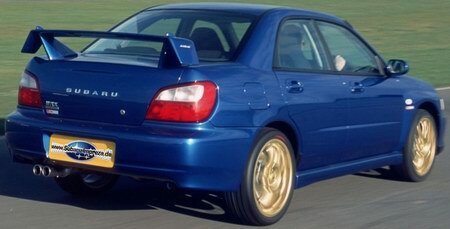 The Impreza got WR blue colour, a key ring and a numbered plaque. The Club Spec Evo 5 was sold as sedan (140 cars) and wagon (60 cars). Everyone was painted in bright orange and got a sunroof, CD-Charger and a mumbered plaque. The Evo 5 was only available with MT. 200 Sedans were built of the "Evo 6". They had leather interior, sunroof, sidebags and were available with MT (AUS$ 45,670) and with AT (AUS$ 48,170), coloured in black mica, WR-blue or premium silver mica. This model is available in white only and including STi modified suspension, STi quick shift, special black interior trim, special badging and a numbered interior plaque done in a reflective white material. Finally it got beautiful dark alloy wheels. 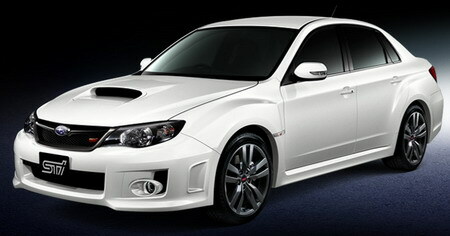 Subaru Australia sold 300 Imprezas of the special edition "Club Spec Evo 7" painted silver, black or blue. Again there was a leather trimmed interior, sunroof and sidebags. The MT version costs AUS$ 45,000 - the AT version AUS$ 47,500. The difference to the Evo 6 are the colour coded side skirts. The limited 040R Cody Cracker Signature Edition has been assembled by STi Docklands in Mebourne for the famous Australian rally drivers national championship success. The Australian Petter Solberg Edition got an aluminium gear knob, a special key ring and a numbered plaque. Only 200 cars were made. The Club Spec Evo 8 was offered in two colours: champagner (see picture on the left) and crystal grey. It got sidebags, leather seats and a sunroof. All 300 units got the well known decals and costs AUS$ 2,500 more than the stock WRX. The MT version costs AUS$ 42,485, the AT version AUS$ 44,985. 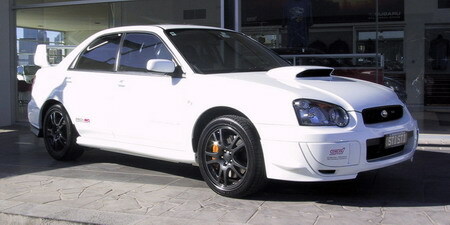 Exclusively for the Australian market Subaru sold the WRP10 in early 2005. 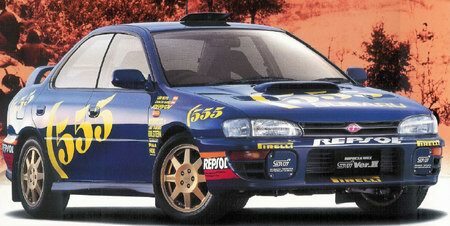 WR stands for "World Rally", the P for the cooperation with Pirelli and the "10" for number of years that the Impreza is available in Australia. 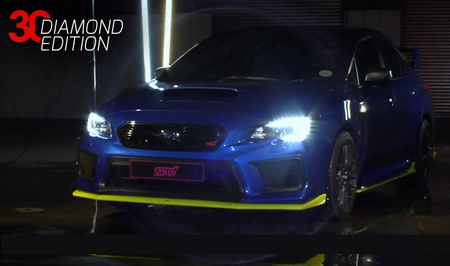 A STi Performance Package boosts the power up to 238 PS (175 kW). The car is lowered by 15 mm and got grey STi alloy wheels with Pirelli P Zero Nero tyres. One of the 200 cars costs AUS$ 48,490. 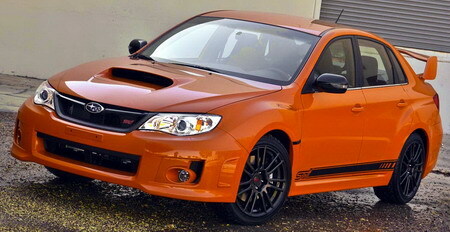 50 units of this extraordinary WRX STi were sold in sunset orange. It costs AUS$ 56,990 and was also available as a 2.0R non-turbo. Priced at $44,490 recommended retail price, the comprehensive package includes chassis, driveline, exterior and interior upgrades – adding more performance, styling and luxury to the already iconic Impreza WRX. New 18-inch wheels and tyres provide a sharper, sportier feel and when teamed with the STI suspension kit lowers the car by 15 mm, giving a more aggressive stance. Handling is refined through an increased spring rate and a lower centre of gravity. 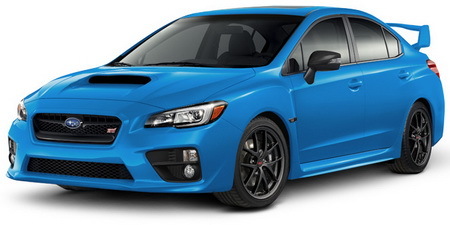 Aerodynamic efficiency is enhanced with the addition of an STI front lip spoiler. Crafted in a matt black semi gloss finish, this tough but lightweight addition improves both stability and cornering. Adding to the sporty feel is a short shift gear lever, featuring a more rigid & direct shift feeling, incorporating reinforced bushes, a shortened shifting stroke and STI aluminium shift knob. Inside comfort levels are paramount with leather trim and an electric sunroof fitted as standard. 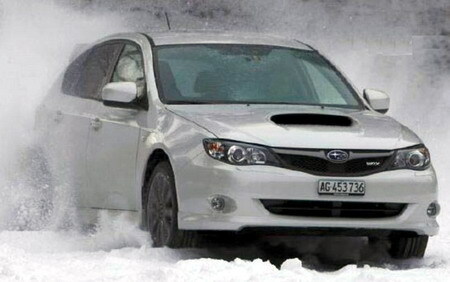 Nick Senior, Managing Director, Subaru Australia said: "This Club Spec is our best yet. It delivers enormous customer value and it will be a very quick seller." Only 300 vehicles will be sold and are available as a manual sedan in WR Blue or Obsidian Black. A unique CS9 Club Spec grille badge has been designed for this special edition vehicle. Only 200 Limited edition models are available. Experience the mind-blowing power and the performance of an Impreza WRX enhanced with STI parts honed on the World Rally Championship circuit. With an STI tuned ECU upgrade, the award-winning 2.5-litre turbocharged Boxer engine has been amplified to a heart-racing 179Kw. The drive dynamics have been augmented by STI lowered sports suspension for even sharper handling. 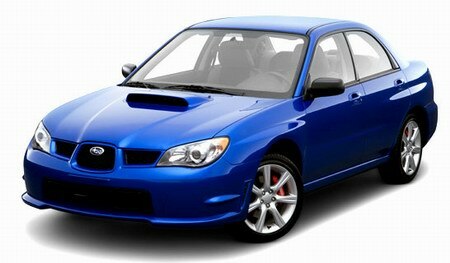 The Impreza WRX tuned by STI is stunning in WR Blue or Obsidian Black. The price is AUS$46,990. As the number suggests, it is the latest in a long-running series of limited edition Symmetrical All-Wheel Drive Impreza WRXs, each of which has proved a retained value winner. 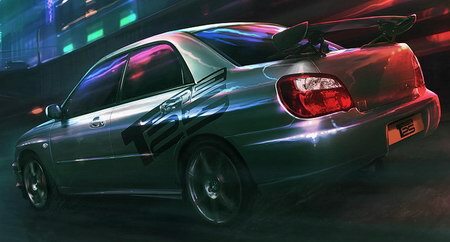 The potent Impreza WRX Club Spec 10 adds several technical enhancements from the Subaru Tecnica International (STI) catalogue, plus luxury interior features. 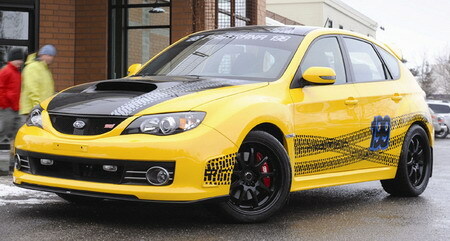 An STI front lip spoiler enhances aerodynamics and improves stability and cornering. A flexible strut tower bar helps to ensure the front wheels maintain excellent ground contact to improve cornering capacity, while delivering a vibrant and sharp steering response. The flexible lower bar and front support kit add strength, reduce chassis flex and produce sharper steering. Lightweight, 17-inch Enkei alloy wheels are half an inch wider than the standard Impreza WRX rim. The extra width stiffens the sidewall, reduces deflection and produces more grip, especially when cornering. Comfort is also a priority and the Impreza WRX Club Spec 10 gets factory-fitted leather seats, sunroof and satellite navigation. Only 250 will be built and all feature special edition badging. 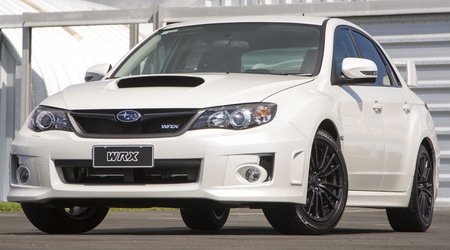 The WRX Club Spec 10 is available in WR Blue, Obsidian Black and Satin White sedan only. This ‘Ace of Spades’, made by Subaru New Zealand, is a truly special limited edition: only seven copies - four sedans and three hatchbacks – were sold. The modified ECU delivers a higher total output of 288 hp. To bring this power to the road, STI suspension and STI strut bar were installed. Completely dark windows, black 17-inch wheels and Ace-of-Spades-sticker completed the optically dark appearance. The exclusive driving pleasure costs NZ$ 49,990, making it NZ$ 4,000 more expensive than the standard WRX. The latest in Subaru’s occasional series of limited edition turbocharged Club Spec WRXs goes on sale in August, with the choice of eye-catching tangerine or black paint, plus a variety of spec upgrades. Just 300 Club Spec WRXs will be available, each featuring: Leather trim, black coated 17-inch alloy wheels, black Subaru Tecnica International (STI) spoiler, black door mirrors, Club Spec external badge and a numbered Club Spec interior badge. The limited edition is available purely as a sedan with manual transmission-only. Tangerine cars will also have orange stitching on the WRX logos on the front seats and on the front seat back rests. Seat and steering wheel stitching is black. The normal Manufacturer’s List Price (MLP) for the kit is $2100, but is available for $1000 on the Club Spec limited edition. The Club Spec WRX is priced at $41,490 MLP. Subaru of New Zealand built 10 cars of this WRX, which is not the Club Spec Evo 11. It has 211 kW power, leather sets with organge WRX-Logos and some STI parts like the big rear wing, strut brace and STI springs. Price: 54,990 $. 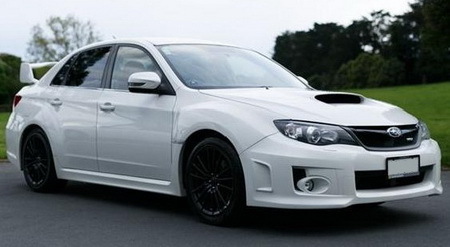 Only eight white WRX were built by Subaru of New Zealand. With a white body sitting on black 18" wheels it costs 54,990 $. Twelve Nemeis were sold for 54.990 $. The speeding up from 0 to 100 kph was fulfilled in only 5.2 Seconds. The Version Z got a huge STI rear wing, 17" alloy wheels and leather interior for New Zealands drivers who wanted to pay 49,990 $. 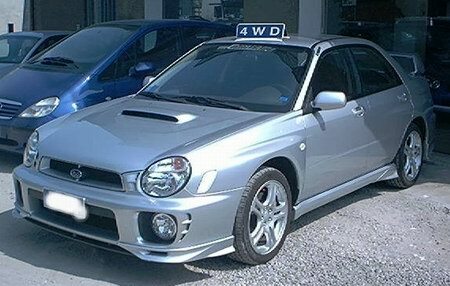 It was Colin McRaes number plate at his World Rally Car of 1996 that inspired Subaru of New Zealand for these six special edition WRX. Price: 54.990 $. 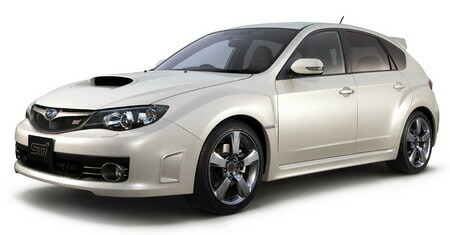 40 years Subaru in Australia and 20 years WRX: That are the reasons for this special edition with parts for 7.000 AUS$. 300 cars were sold, all coloured in WR blue. 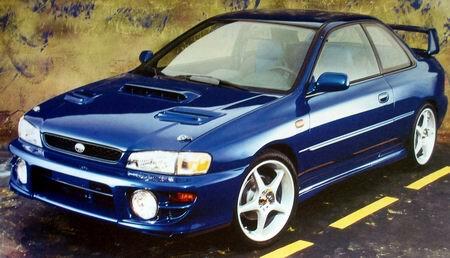 Like in USA, also the Australian importer sold the Hyper Blue turbo Imprezas. Here, also the WRX got a chance. One of the 200 cars costed $48,890. That is $4,000 more than the normal Premium WRX. Also the STI and the BRZ were sold as a blue special edition. It has two differences to the american cars: RHD and another front grille design. 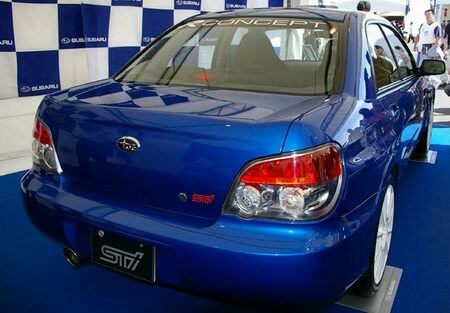 The Hyper Blue STI costet $2.000 more than the normal Premium STI, so it was sold 50 times for the price of $57.690. 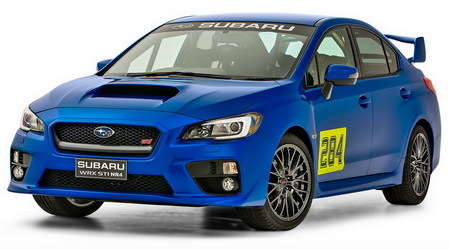 In July 2015 Subaru of Australia announced the WRX STI NR4 racing car. It was available from October on. These cars were imported from Japan as base models and they are then submitted to the tender ministrations of Subaru’s racing partner Possum Bourne Motorsport (PBMS). Here the base model is transformed into the NR4, which is a purely competition race car. The NR4 is named after the new FIA regulations on racing cars in Australia. The NR4 classification has replaced the outgoing N4 and R4 classes. They can race in WRC2, ERC2 regional and also progressive national championship races. The NR4 is an absolute beast of a racing car that has a closer heritage to the Japanese street model. 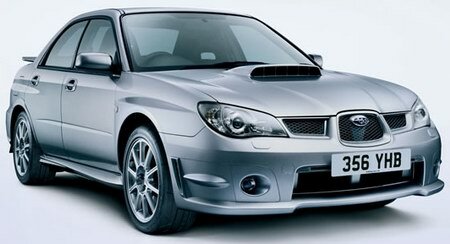 Power is provided by the Subaru 2.0 litre four cylinder turbocharged Boxer powerplant. This engine produces 227kW of power and 422Nm of torque. As a comparison, the Australian production car has a slightly more modest 221kW of power and 407Nm of torque. Although the Australian production model has a 2.5-litre engine, the NR4 has the 2.0 litre unit that has been chosen for the lighter weight and then raced tuned by the boffins at PBMS. This engine has three race only tiers and six option packs. The option packs cover the engine, braking, driveline, suspension and competition options for gravel or tarmac. This attention to detail is allowing a huge variety of options for setting the car up. The NR4 is available in both white and WR Blue. It is aimed squarely at buyers that are amateurs through to professional racing teams. Subaru has a Tier 1 example that is being used for promotional purposes to demonstrate how the car would look and act as a club level racer. This model has the following equipment fitted: an FIA approved roll cage, OMP winged seats, OMP 6 point harnesses, OMP steering wheel, gunmetal grey interior paint, PBMS fibreglass console, PBMS seat runners, PBMS fibreglass door panels, PBMS fibreglass rear parcel tray, PBMS fibreglass radio panel, a PBMS fibreglass driver’s foot tray, airbag removal, window switch relocation and a removal of the interior sound deadening. After 50.000 sold WRX in Australia, the importer decided to celebrate with a new special edition which was limited to 200 cars. Based on the WRX Premium variant, the car gained 18-inch black BBS alloy wheels, along with red accents to the partial leather seats, door trims, air-conditioning dials and on top of the driver’s display. Manual models also add an STI gear knob. The engine of the standard WRX remained, which means there was a 2.0-litre engine producing 197kW of power and 350Nm of torque. 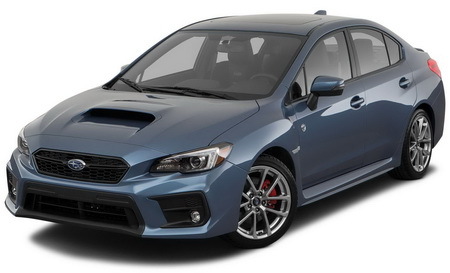 Commanding a $2000 premium over the standard WRX, the WRX Special Edition was offered with both six-speed manual and eight-speed CVT automatic transmissions from $46,890 and $48,890. The available colours were Crystal Black, WR Blue, Dark Grey, Crystal White and Ice Silver. These extras were available at the value-packed recommended price of only $2,350 over the recommended driveway price of the standard WRX Premium. Only 100 cars were available. Pricing is only an additional $750 at MLP compared to a fitted RRP value of over $3,000. Available in Crystal White Pearl, Dark Grey Metallic, Crystal Black Silica and WR Blue Pearl exterior paint with Black interior trim only. 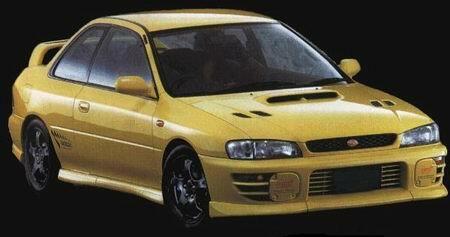 In Japan there was a vast amount in different executions of the Impreza in the nineties. Indeed, they had the normal WRX like the european GT, but in Japan it had more HP (not least because of the 100-octane petrol usual there). However, the spoiler remained up to the last model year 2000 always the small one, with us famously from the model years 1996-98. There came the "Type-RA" models which were equipped extremely spared to save weight. Thus these had basically no spoilers, no side skirts and were available only in white. There was radio, electric window lifters and air-conditioning only against surcharge. Because of another transmission it reaches the maximum speeds from 240 km/h only with 8,000 rpm. RA "racing-changed" stands for "Race Altered". 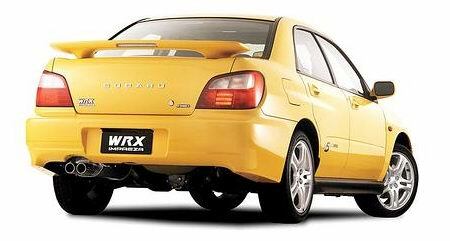 The STi version models were advancements of the WRX and had bigger spoilers than the WRX (in version I-IV our MY99/00 spoiler, in version V-VI an even bigger wing). In the beginning they had stronger engines than the stock WRX and some parts like outside mirror and side skirts were colour-coded. 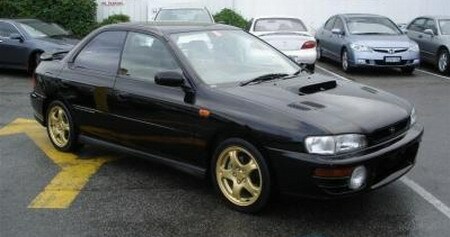 As if this was not enough, there were also hybrid forms like the "Type RA STi Version". Now this had again a spoiler and other equipment signs. The Type-R is equipped like the "normal" Japanese STi 4-door model, indeed, only from the version III available. 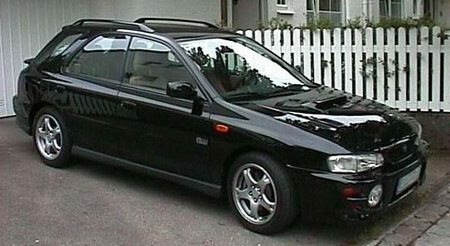 The biggest exterior change is the silhouette: The Type-R is the first 2-door coupé of the Impreza which served later than presentation for the 22B and the P1. He had manual differentials as well as water injection on the loading air cooler to raise the achievement at short notice. The Type-R has no ABS. For the celebration of the rally world championships there were - based on the Type RA WRX STi and Type R models - the blue special models V-Limited (from II to IV). If the SWRT did not win the world championship in the year before, they were called simply "Limited" (Version V and VI). They had blue seats, special gear knobs and Rally decals. 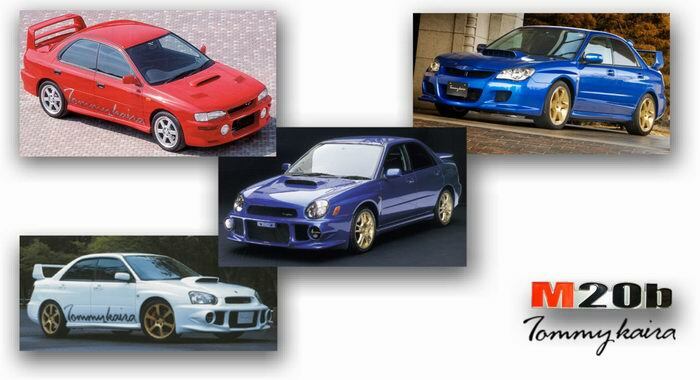 The independent Japanease tuner Tommykaira modified the Impreza WRX next to other models of the Subaru range like the Legacy or the Pleo. 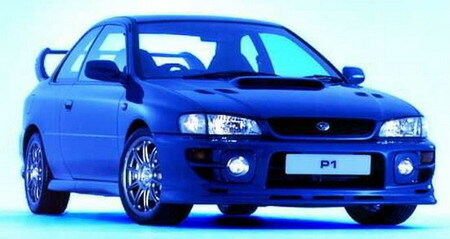 The Impreza M20b was available from 1994 on. To celebrate the victory at the WRC, the special edition "555" was sold in Japan. The customers could chose if they want the original SWRT badges or not. 500 cars were built as wagon and sedan. Subaru presented this cabriolet at the Tokyo Motor Show in 1995. It was only a concept car and was never produced officially. 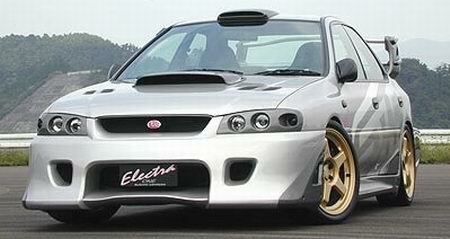 Only a few enthusiasts built such an Impreza for their own. 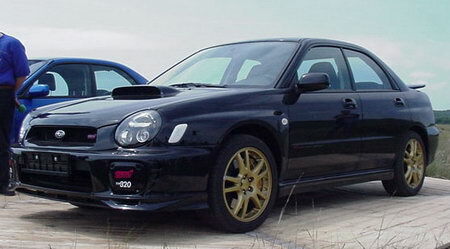 At the beginning of the production of the 2-door coupés (typeR), Subaru sold a special edition called "Signature" with a yellow paint and black alloy wheels. 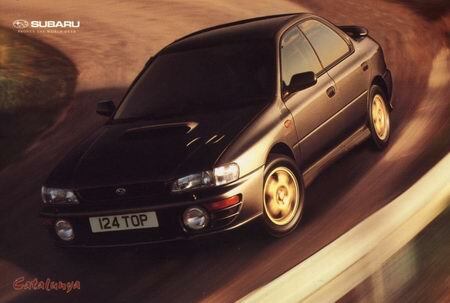 The Impreza 22B was produced by "Subaru Tecnica International" (STi). The 2-door coupé has been built 399 times for the japanese market and 25 cars for export purposes. Five cars made their way to Australia but got no license for driving on public roads. 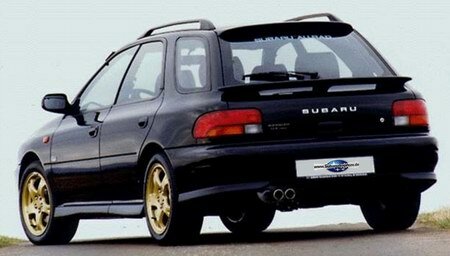 At the end of the nineties, many Japanese wanted to drive cars in retro style and so Subaru decided to modify their models. Next to the Sambar Classic and the Vivio Bistro the Impreza Casa Blanca joined this army of very dubious design experiments. Nevertheless there were some big fans of this car and also a Casa Blanca fan club has been founded. The car was available as 4-door sedan and 5-door wagon. The Electra One was a concept car of the later introduced S201. 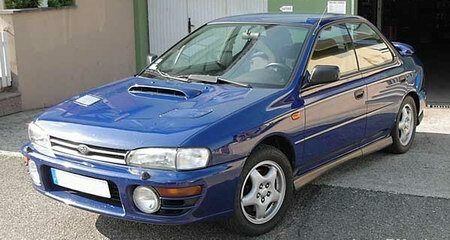 Nearly everything of the bodywork was different from the stock Impreza: wheels, bumper, sideskirts, spoilers, scoops, lights and also the interior. The concept car "Electra One" was redesigned in some parts to get it on the road as a special edition of 300 cars. It now had the stock head and rear lights, 6-spoke-alloy wheels and a new spoiler. The hood scoop also disappeared. 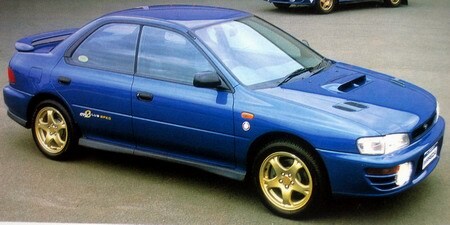 The Type RA was available from September 2000 with 16"- and 17"-wheels. It was no special edition, but a special model! 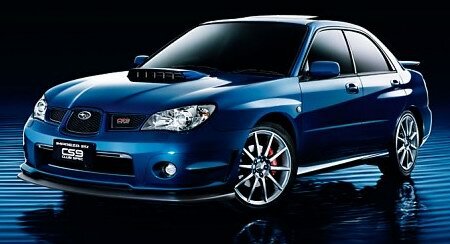 The last STi wagon in history is still very popular by the fans and the prices are stable at a quite high level. 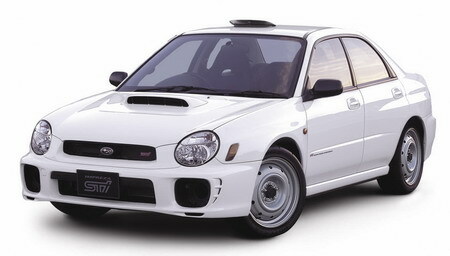 The non-turbo bugeye Impreza was called "WRX NA" in Japan (155 hp). 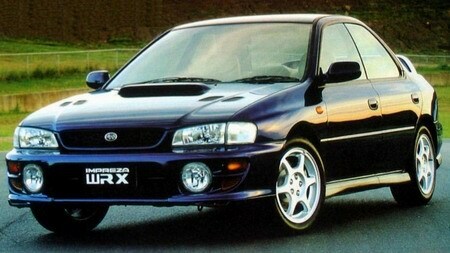 The turbocharged version had 250 hp and badged as "WRX NB". The special edition WRX NB-R had some extras like the higher rear wing. It was available in white, silver, blue and black colour. The traditional "Limiteds" were also available in MY 2002. They had the same rear wing like the WRX NB-R.
To enter FIA-approved racing and rallying championships that take place around the world, cars must be homologated according to the FIA regulations. Group N (production cars) is one of the rally and off-road vehicle groups set forth by the FIA. Defined as large-scale series production touring cars, Group N homologation imposes strict limits on modifications to production models and is known as the category that best reflects the performance inherent to the basic production model. Compared to the Impreza WRX STi, Impreza WRX STi spec C is about 90 kilograms lighter through the adaptation of lighter glass, a trunk lid composed of aluminum, and thinner roof construction. A rear crossbar has been fitted to further improve body rigidity. The turbocharger in the Impreza WRX STi spec C uses precise ball bearings in the shaft to reduce friction, thereby offering a smooth and speedy turbo boost and providing ideal engine response. A large water reservoir for the intercooler water spray as well as an air-cooled engine oil cooler have been implemented to ensure stable engine performance. Based on the Impreza Sports Wagon, the TYPE EURO has been jointly styled by Austria-based Porsche Design and FHI and incorporated new exterior components jointly developed by the two companies. The TYPE EURO projects sophistication with its original exterior design as well as its dominant presence. It features distinct sporty looks with sharp and clear lines, adopting new designs for front and rear bumpers, front grille, and roof spoiler, while retaining the overall characteristics of the Impreza Sports Wagon. The 17-inch aluminum-alloy wheels on the turbo-charged engine model add to its sporty image. TYPE EURO TURBO with a 2-liter horizontally opposed 4-cylinder DOHC turbo-charged engine; TYPE EURO 20 with a 2-liter horizontally opposed 4-cylinder DOHC engine; and TYPE EURO 15 with a 1.5-liter horizontally opposed 4-cylinder SOHC engine. With this wide array of model variations and options, FHI has set a monthly sales target of 100 for TYPE EURO. 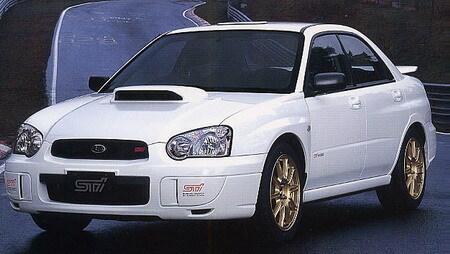 The WRX STI Spec C was the base for Group-N-Rallycars of private teams. After Petter Solbergs win at the World Rallye Championship the well-known V-Limited special editions gained a revival. 555 cars were built with a special suspension, front spoiler lip, roof hood, aluminium gear knob and SWRT badges at the fog light covers and the front doors. The suspension tuning was made by Toshi Arai. The car has 15 mm less ground clearance and is available only in WR blue. The price was from 3,350,000 Yen to 3,510,000 Yen. The WRX model of the V Limited got STI applications (except the bonnet hood), a front spoiler lip and golden 17 inch alloy wheels. Inside the STI seats are mounted - just without the STI emblem. Like the STI V-Limited, it has SWRT stickers at the fog light covers and the front doors. The 5MT-Version costed 2,590,000 Yen, the 4AT 2,721,000 Yen. 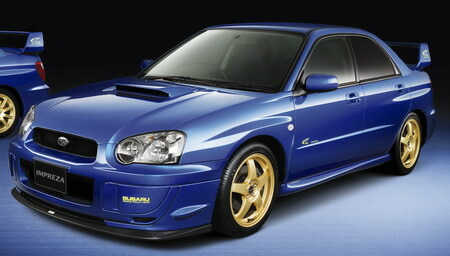 In July 2004 Subaru presented the special edition WR-Limited. Also in July 2004 the Spec C WR-Limited was presented. FHI wanted to produce more than 1,000 units of the Impreza WRX STi spec C during 2004, which is the minimum level of production required for Group N classification, and the company was planning to have the vehicle homologated before the 2005 rally season begins. The Impreza WRX STi has long demonstrated its strengths in Group N class races; in fact, the top three drivers in the 2003 FIA Production Car World Rally Championship (PWRC) for Group N cars were all driving the Impreza WRX STi. Now lighter and even more suitable for competition than the Impreza WRX STi, the Subaru Impreza WRX STi spec C is packed with new features and is equipped with a higher performance engine. The 2004 spec C is cognizable at the new rear wheel house. In comparison to the normal Spec C model these 300 cars had a big rear wing, silver 17' alloy wheels and Type RA plaques. The fuel capacity were 50 litres. Also in 2004 the V-Limited was sold. It was only available in blue and had 250 hp. 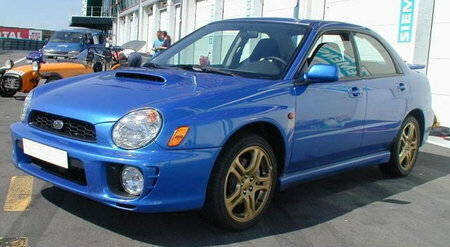 Subaru sold exactly 555 cars of the S203. 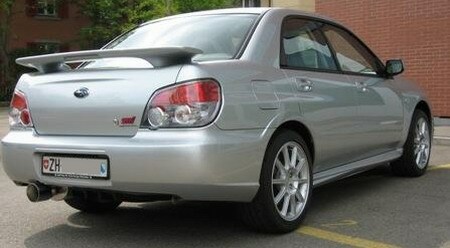 Beside the special rear wing and the STI alloy wheels it got more power like its predecessors. Compared to the predecessor model, the force distribution has been changed to 41:59, a reprogrammed CPU and a new engine air intake system provides more torque. Moreover, the new model has reversed suspensions and a new exhaust system. 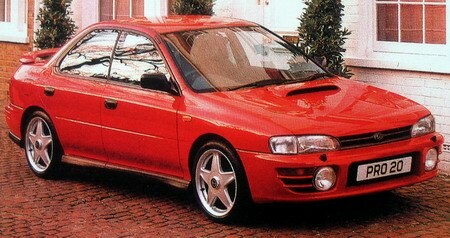 Tommi Makinen refined this car to a Group N racer based on the WRX STI Spec C. It was sold to rally teams. click the image to see more photos of the Spec C "Tommi Mäkinen"
For the homologation as a Group N Rally Car, Subaru had to sell 1000 cars of the Spec C. Force ratio has switched to a 41:59 setting, a new air intake and ECU programming leads to more torque output. Beside thie the spec C has a 10 mm lower upside down suspensions and a new exhaust system. Like always the WR Limited was only available in blue and was presented in the middle of the year. Again, it got the STI rear wing and other STI parts. 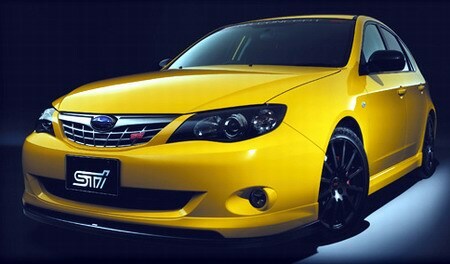 600 cars of the S204 left the assembly lines of Subaru and STI. The car has the 2.0-litre engine with 320 PS and 432 Nm torque again. 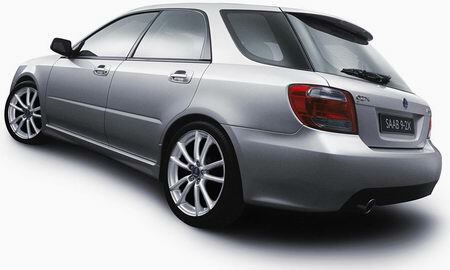 After the success of the discreet European versions of the STI, Subaru Japan tries to copy that with the "A-Line". It has a front and rear spoiler lip and is available in Premium Silver Met. (1G), Obsidian Black Pearl (2J) and Crystal Grey Met. (8W). 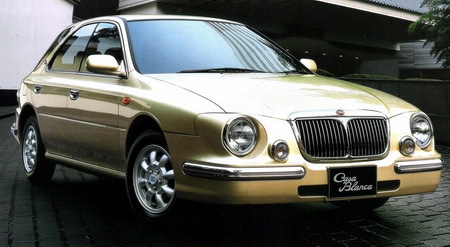 The A-Line costs 3.444.000 Yen and has the JDM 2-litre engine generating 280 PS. The "R concept" based on the spec C model and generates 280 PS. It is fitted with Recaro sport seats and a front spoiler lip but without a rear wing. There were only 300 Type RA-R been made. They have 320ps (316hp) @6400rpm, 44.0kgm (319lb-ft) @4400rpm a 6 gear MT, DCCD and they are lighter than the STi (1390 kg). It is available in white, blue and yellow. At the Tokyo Auto Salon 2008 Subaru Tecnica International presented the first special edition of the new hatchback Impreza. The NA Concept had no turbo but many sporty parts such as STI-Frontlip spoiler, STI-grille, STI rear spoler lip, Recaro seats, STI gear knob, STI pedals, STI chassis, 4 pistons breaking system at the front and special 17" alloy wheels. 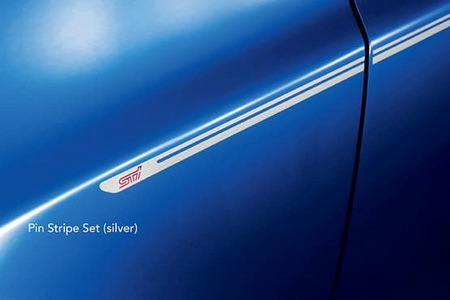 The 20th anniverssary of STI has been celebrated with this special edition Impreza. Next to its black rear wing it had a front spoiler lip and badges. Leather seats are highlighted with red seams. It was available in white, blue and black and limited to 300 cars. Based on the Impreza WRX STI, the WRX STI A-Line model was developed to offer its distinctive driving performance to a wider range of customers by integrating 2.5-litre turbocharged Boxer engine and 5 Speed Automatic Transmission with Prodrive's SPORTSHIFT. In addition, this WRX STI was given some refinements to enhance comfort and quality feel; 8 way power adjustable front seats and a new body color, “Satin White Pearl”, is now available. - Leather seats are available as optional and include (front) seat heating. - Soft leather door trim with silver stitch is featured. The Concept A as the forerunner of the new A-Line model has been equipped with the 2.5 litre engine. The driver could choose from a lot of accessoires to make driving much more pleasant. Opposite to the Concept A, the Concept C is made for sport ability drivers. It is the precursor of the Spec C and is equipped with 19" alloy wheels and the 2.0 l boxer turbo engine with a 6 gear shift. As the other Spec-Cs the new version has a lighter body. There was an 18" wheel version and a 17" version available, both comes with 308 PS. 900 cars have been sold in the colours blue and white. In combination with the 18" package it was also yellow, silver and black available. At the Tokyo Motor Show 2009, Subaru revealed the STI Carbon concept car. Based on the A-Line with its 5-speed automatic transmission it has a carbon made roof which reduces the weight for a better roadability. At the interior an alcantara leather topped dashboard gave a luxurious feeling. The R205 is the top performance model of the WRX STI. It features new and exclusive equipment and makes full use of specially designed features and performance parts of the “WRX STI spec C” model. The “R” of R205 stands for “Road Sport”. The R205 delivers an increased 235kW (320PS) of maximum output and 431 Nm torque. It is limited to 400 cars. The A-Line gets the aditional brand "typeS" in the MY 2010 which ment that this is the sporty version of the A-Line. It also got the 2.5 litre engine and an automatik gearbox. It is available in white, blue, silver, crystal gray and black paint. The typeS was sold from January till July and than the normal A-Line came back to the show rooms. In July 2010 Subaru presented the first A-Line with the new facelift look. It was the first sedan in the third generation and got the usual A-Line extras like 2.5 litre engine and automatic gearbox. The seats got brown leather highlights. 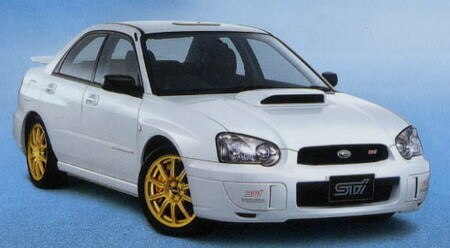 In December 2010 the new Spec C has been presented by Subaru. It had the new facelift front. There were two versions, one of them had 17" alloy wheels, the other one had 18". The Subaru Impreza STI tS doesn't offer extra power, but it does have a lot of extra goodies in comparison to the standard model. The Subaru Impreza STI tS is based on the 2011 four-door sedan version of the STI, and comes with a carbon fiber roof. This reduces the weight significantly, which in turn, improves performance and handling. Even more weight saving measures have been taken with the Subaru Impreza STI tS through the introduction of an aluminum hood. The Subaru Impreza STI tS also comes with a revised suspension, with new front and rear springs and damper settings, and a front stabilizer bar. At the interior, the Subaru Impreza STI tS features new leather RECARO sport seats, and new gear knob and brake lever coverings. 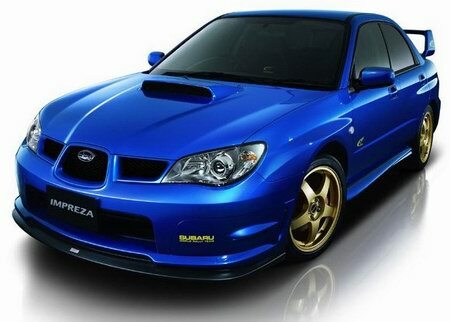 The Subaru Impreza STI tS price starts in January 2011 at just over 4.2 million YEN. Subaru Tecnica International, which manages all of Subaru’s motorsport activities, put in their years of engineering expertise into the original tune-up of 4-door SUBARU IMPREZA WRX STI. S206 is a STI complete model that has been refined to ultimate maneuverability, stability and handling performance. All 300 cars had the 2.0-litre engine. The NBR Challenge package was assembled to commemorate the class win at the 24-hour race on the Nürburgring in 2011. Unlike normal cars on the S206 a carbon roof, the striking rear spoiler and the black rims can be seen. It also has red sill plates by Subaru Tecnica International and a sticker on the tailgate. Only 100 cars were built. In November 2011 Subaru released the new A-Line edition in Type-S-Style. It was available as 4- and 5-door version again. The 17" version of the first 4door spec C since 2006 costs 3,170,000 Yen. The version with 18" and big rear wing costs 3,520,000 Yen. The 2.5 Litre engine of the A-Line delivers a maximum output of 300 PS. It costs 3,150,000 Yen in both 4 door and 5 door trim. RECARO bucket front seats as optional equipments. Brembo 17-inch front opposed 4 pot and rear opposed 2 pot ventilated disc brakes as optional equipment. Price: 3,412,500 Yen for the 5 door hatch, 3,465,000 Yen for the 4 door sedan. 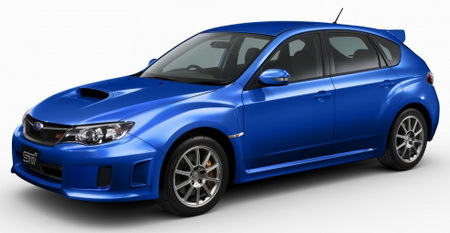 At the Tokyo Motor Show 2015 Subaru presented the STi S207 vor. 400 cars were built with 328 hp. The "S207 NBR Challenge Package" was sold 200 times, the "Yellow Edition" 100 times. 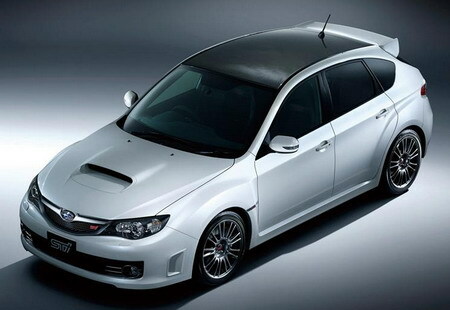 At the Tokyo Motor Show 2015 Subaru has shown a special edition of the WRX S4 limited to 500 cars. These vehicles had leather interior made by the italian designer Mario Levi. The cars have been sold only in Japan. 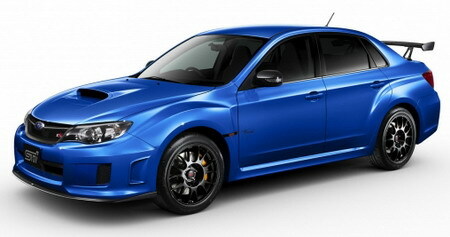 Subaru launches a limited-edition model based on the “WRX S4”. The model will be on sale for a limited period starting October 4, 2016 through March 12, 2017. In pursuit of driving performance, the WRX S4 tS inherits some expertise of the S207 which stands at the pinnacle of the STI complete car lineup. The model also adopts advanced safety features such as the EyeSight driver assist technology. has also been enhanced with Brembo opposed-piston 4-pot brakes in front. The new model comes with distinctive specifications: On the exterior these include STI-designed BBS 19-inch forged aluminum wheels, cherry red pinstripe on the mesh-type front grille and rear bumper, large front under-spoiler, black roof antenna (shark fin type), while the interior features STI-spec Recaro front bucket seats and an exclusively-made luminescent speedometer. At October, 25th, Subaru presented the new S208 at the Tokyo Motor Show. 450 cars have been sold. 350 cars of them got the Nürburgring Challenge Package which had the colours mint blue, white and WRC-blue. The prices reached from 6.264.000 Yen to 7.106.400 Yen and the power ended at 329 hp. The TYPE RA-R, based on the WRX STI, is the complete model to commemorate STI’s 30th anniversary of its establishment in 1988. Developed under the concepts of “light weight”, “speed” and “enjoyment”, the TYPE RA-R pursues “Running, Turning and Stopping”, the fundamental performances of an automobile. With the application of lightweight parts and even taking some parts off from the base model, the TYPE RA-R saves 30kg of weight compared to the previous complete models “S208” and “S207”, and is also 10kg lighter than the base model WRX STI. Combined with lighter body is EJ20 Balanced BOXER engine, which has also been applied for S208, delivering the highest output among all the STI complete models. 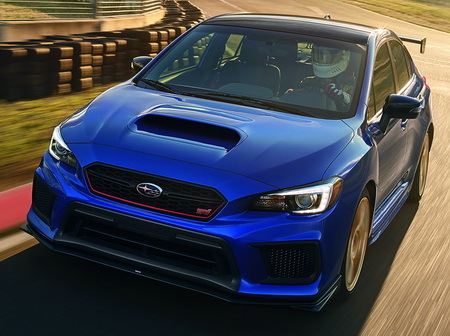 With the power-to-weight ratio exceeding that of S208, the Type RA-R brings “speed” and ”enjoyment” at the highest level STI complete models have ever brought. The power unit enhancement the TYPE RA-R receives is not just EJ20 Balanced BOXER engine delivering 329PS. A performance shroud with high rigidity enables intercooler to work at its maximum cooling efficiency. A performance exhaust system with lowered backpressure also contributes to higher engine output and more direct acceleration response. With these enhancements, the TYPE RA-R engine revs up smoothly and its exhaust note evokes high performance of the car. Dampers and coil springs are exclusively designed for TYPE RA-R. The car is equipped with Michelin Pilot Sport 4S tires, which feature different compounds between the outer and inner parts of the tread and provide strong tire grip on both dry and wet road surfaces. Brembo brakes with high performance brake pads for stronger brake force are also adopted for this model. These enhancements give extra margins for the TYPE RA-R and better controllability provides peace of mind for driver. Only 500 cars will be sold until december 2018. Here you can also find pictures of the concept car. Rallye-Profi Toshi Arai built this Special Edition powered by 380 hp. One of the 50 cars will cost nearly 5 million Yen. 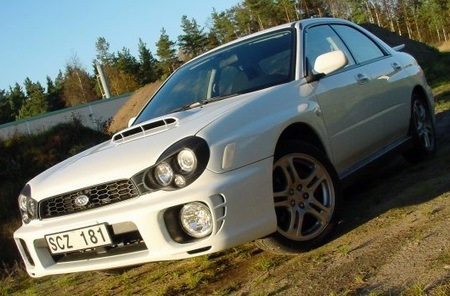 To adopt the sporty image of Subaru to the American market, SoA presented this non-turbo 2.5 RS with a 168 PS engine. The torque was 162 Nm and accellerated the Impreza in only 8.1 sec to 60 mph. The price was 19,300 $. From the year 2000 on, the RS was also sold as a 4 door sedan. 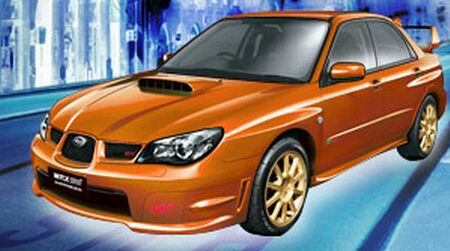 At the end of the first generation Impreza, 13,825 cars were sold. The Outback Sport was a non-turbocharged car, too. The scoop was only for optical reasons. 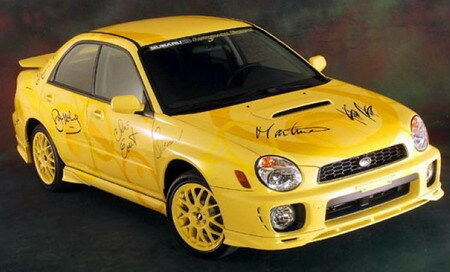 SUBARU OF AMERICA (SOA) created this one-of-a-kind 2002 Subaru Autograph Edition Impreza WRX in Blaze Yellow as a fund-raiser. Proceeds will benefit patient care and research at the University of Washington Medical Center Breast Care and Cancer Research Center in Seattle. 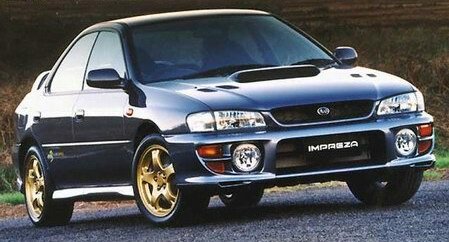 The Autograph Edition WRX, inspired by Martina Navratilova, longtime Subaru driver and spokesperson, was sold at auction Oct. 6, 2001, at a black-tie event at the PRO Sports Club in Seattle. Navratilova has worked closely with SOA in support of philanthropic causes since 1995. “The Autograph Edition is a great example of our extraordinary partnership,” she said. The vehicle includes signatures from tennis players Andre Agassi, Jennifer Capriati, Jim Courier, Lindsay Davenport, Chris Evert, Steffi Graf, Billie Jean King, John McEnroe, Patrick McEnroe, Martina Navratilova, Patrick Rafter, Pete Sampras, Jonathan Stark, Serena Williams and Venus Williams. 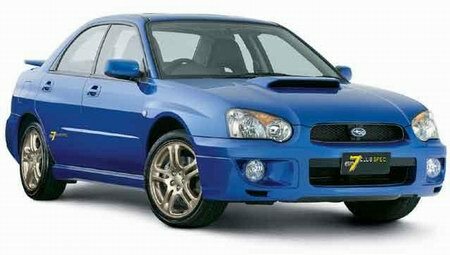 In August of 2002 Subaru Canada introduced a new Limited Edition model based on the rally proven Impreza WRX sedan and sport wagon. 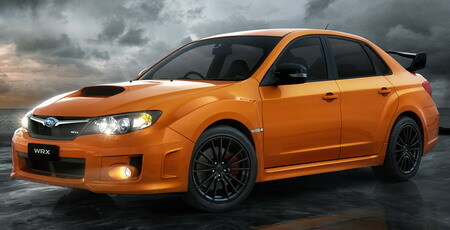 This model has been designated the Impreza WRX Spec R1. This exciting true Limited Edition vehicle was available only in very limited quantities. There was a total of 125 cars produced, 90 sedans and 35 sport wagons. The Spec R1 was available exclusively with 5 speed manual transmission and in the bold new Sonic Yellow (3V) colour. 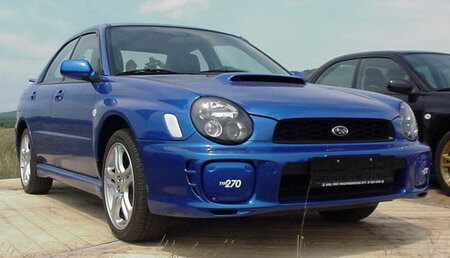 These limited edition vehicles had all of the standard features of the 2003 Impreza WRX plus the following additional equipment list that is unique to the WRX Spec R1 and represents more than $5,000 (MSRP) worth of additional value. When parts of the Subaru stock was hold by the General Motors Company, they built a Saab with the form of the Impreza Wagon. The 9-2X had 165 PS or 227 PS with the "Aero"-engine. For tuning fans, Subaru of America is selling the WRX TR ("Tuner Ready"), which has no sport seats, no fog lights, no side skirts and no rear wing. 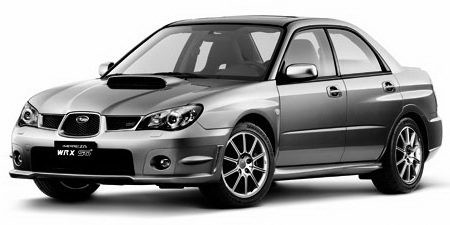 So the price for the sedan (24.000 $) is 1,000 $ lower then the standard WRX. Instead of a CD Changer it has a single CD Radio and also an A/C without climate control. The WRX Limited gets black or beige leather seats. 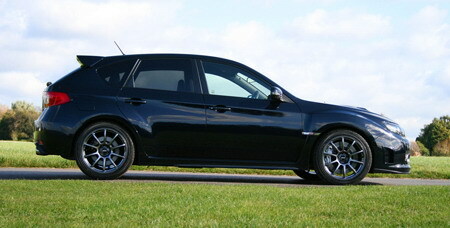 The US version of the unspoilered STI discerns in sone aspects from the European Editions Type G, A-Line, Spec D, Limited). The engine delivers 293 PS and there is a spoiler lip at the trunk and at the front. At the interior there is a self-dimming rear mirror with an integrated compass. Finally there is a sunroof and a plaque at the center console. Production is limited to 800 cars (400 in Satin White Pearl and 400 in Urban Grey Metallic). On the occasion of the third victory of the North American Rally Championship for Subaru of America, there is this single piece named after the successful rally driver. It is equipped with a carbon bonnet, including rear spoiler, a front spoiler lip and PIAA daytime driving lights. An SPT-chassis and the BFGoodrich G-Force Super Sport A/S tires on the black work-rims provide better performance. The interior is dominated by blue alcantara with yellow stitching and a professional sound system, which is also connectable to the Xbox 360. This stepped-up version of the WRX has been enhanced with High-intensity discharge (HID) headlights for better illumination, SIRIUS® Satellite Radio and leather-trimmed seats. It is powered by the 265-hp turbocharged engine. 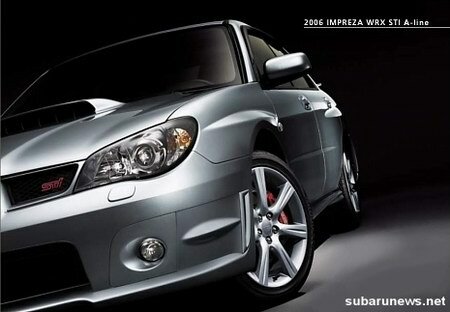 Subaru has introduced the 2010 Impreza WRX STI Special Edition at the Los Angeles Auto Show in december 2009. 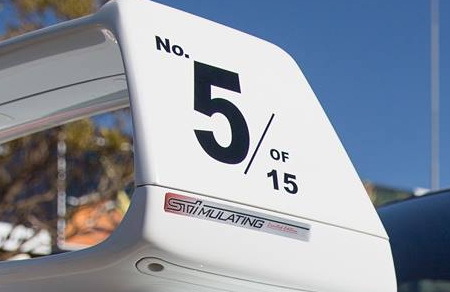 To commemorate their fourth consecutive Rally America championship, SoA created a more intense STI by eliminating anything that doesn't help it go fast. 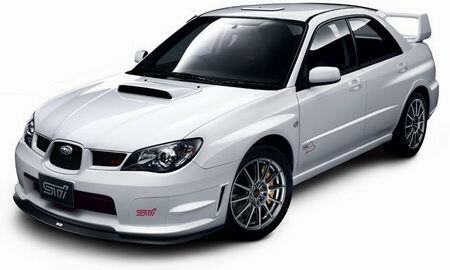 Then they added a Nurburgring-tuned JDM STI spec C suspension for better handling, swapped the wheels for spec C alloys, and an exclusive run of only 125 built will come in Aspen White. 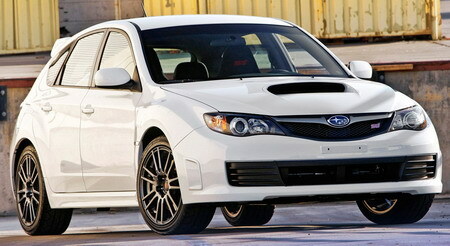 200 WRX and 100 WRX STI of this special edition Impreza will be sold in spring 2013. All of them are in Tangerine Orange trim with black decals and black alloy wheels. Inside they have orange color matched floor mat, seat and shifter boot trim stitching. 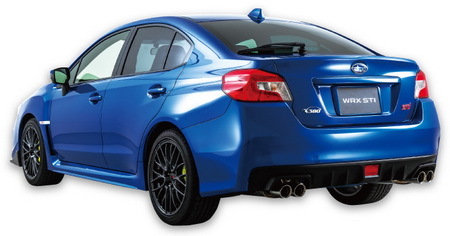 In the middle of October 2014, Subaru Canada presented the Tsurugi Edition. It had no rear wing but a front lip spoiler and a special emblem at the rear. Inside the navigation system was replaced by a 10" subwoofer and leather seats. Tsurugi is named for a traditional Japanese two-sided broadsword. This Tsurugi Edition trim features were exclusive to Canadian market cars. The price was 41,495 $. 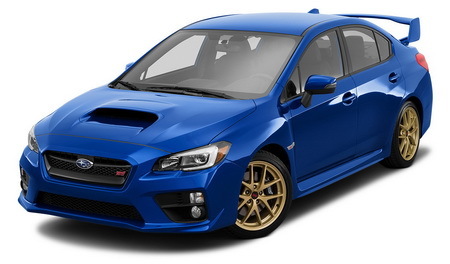 The WRX STI Launch Edition was an exclusive livery for an exclusive set - WR blue pearl paint, gold 18" BBS forged-alloy wheels, customized blue-accented interior, short-throw shifter and keyless access & start. Limited to 1,000 units, the Launch Edition was not around for long. It was available since spring 2014. The Series.HyperBlue trim brings exclusive blue stitching to the standard Alcantara® seats, leather wrapped steering wheel, manual transmission shifter boot, console as well as carpeted floor mats with the traditional Cherry Red STI logo. 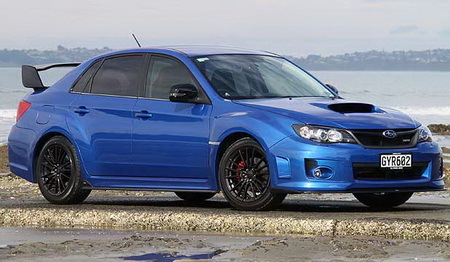 Series.HyperBlue WRX STI wears 18-inch BBS® Black Alloy wheels and black badging with black painted exterior mirrors. SUBARU STARLINK 7.0” Multimedia Navigation System comes standard on this trim with 9 Harman/Kardon® speakers and 440-watt amplifier. On January, 14th 2016 Subaru Canada has announced special-edition BRZ and WRX STI models, named Hikari Edition, available across Canada featuring a striking Hyper Blue exterior paint finish. They were limited to 100 and 200 units, respectively, with base prices set at $30,495 and $41,895. Both cars sport exclusive black-painted exterior trim accents, black wheels, and unique blue interior seating and trim enhancements. 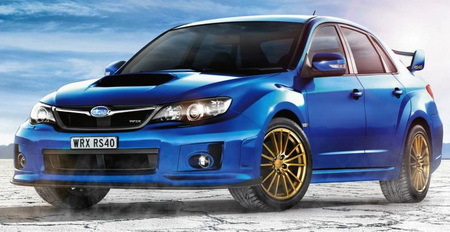 The WRX STI Hikari Edition got 18” BBS forged alloy wheels to reduced unsprung weight. Hikari means "light" or "beam of light" evoking the speed, performance, and precision of the Subaru WRX STI and BRZ. At June, 8 Subaru of America presented the first TypeRA in generation four. It gets the Nürburgring letters because of a new record attempt (RA) at the Nordschleife in summer 2017. - Ultrasuede® trimmed Recaro® front seats with 8-way power driver’s seat. - SUBARU STARLINK 7.0” Multimedia Navigation System with Harman Kardon speaker system: 9 speaker, subwoofer and Harman Kardon 440-watt equivalent amplifier. 750 cars of the WRX are available exclusively with the 6-speed manual transmission. The model’s exterior is painted in Cool Gray Khaki and comes with exclusive Crystal Black Silica badging and foldable exterior mirrors as well as 18-inch alloy wheels with black finish. 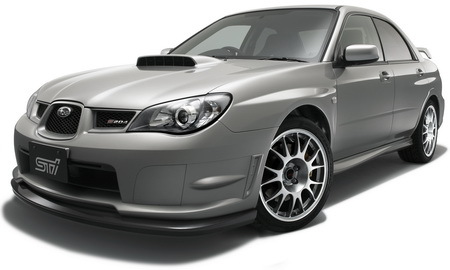 The Series.Gray WRX is based on the WRX Premium that includes the Performance Package with Ultrasuede-trimmed Recaro seats, 8-way power driver’s seat, JURID front brake pads and moonroof delete. It also adds LED Steering Responsive Headlights, LED fog lights and Keyless Access with Push-Button Start. 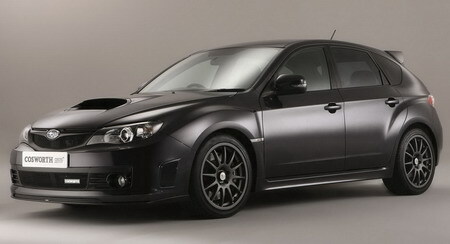 The WRX Series.Gray is priced at $32,595. 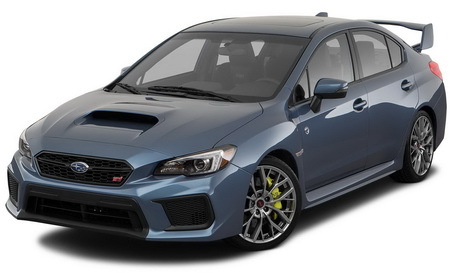 The limited production WRX STI Series.Gray offers Cool Gray Khaki exterior, exclusive Crystal Black Silica badging and foldable exterior mirrors as well as 19-inch alloy wheels with black finish. The Brembo brake calipers come in silver finish with black STI logo. The interior features black Ultrasuede with Carbon Black Leather bolster and Ultrasuede steering wheel with red stitching. Handling for the WRX STI Series.Gray is upgraded with a unique Bilstein STI sport-tuned suspension featuring Bilstein dampers for the inverted-strut front suspension and double wishbone rear suspension. The limited edition also includes Recaro seats with 8-way power driver’s seat and Keyless Access with Push-Button Start. The 250 cars of the WRX STI Series.Gray are priced at $39,695. 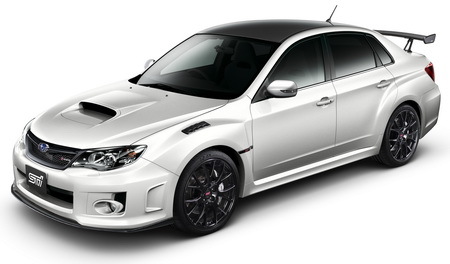 Subaru Tecnica International introduced the limited-edition STI S209, the first-ever S-line STI product produced exclusively for the U.S. market. As an S-line product, the STI S209 encompasses upgrades in power, handling, aerodynamics and driver engagement, and undergoes final assembly in Kiryu, Japan. 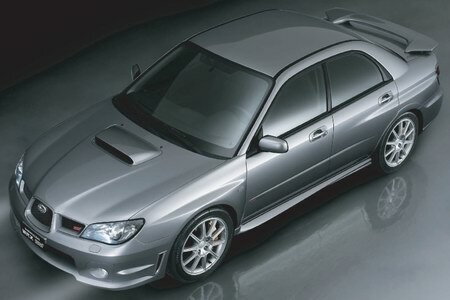 Here it receives engine modifications and bodywork alterations that in total require it to be homologated for the U.S. by STI; thus, the S209 is considered the first “STI-built” Subaru sold in the U.S.
For more data click at the picture. The EJ25 turbo engine inherited from standard U.S. model WRX STI has been exclusively tuned to deliver the optimal power output. To feed more air to this engine, the S209 uses high-flow air intake system featuring an exclusive intake duct and induction box with conical air filter. The air is then led to the exclusively designed turbocharger with a larger turbine and compressor. The vehicle’s exhaust system is equipped with high-performance mufflers with larger exhaust tips for less airflow resistance. Controlled through STI-tuned engine control unit, the powertrain delivers an estimated 341 horsepower, the highest output ever in the STI tuned models. The engine also utilizes forged pistons and connecting rods to secure reliability as production model. This is not an official website of Subaru, Fuji Heavy or any other company related to Subaru!